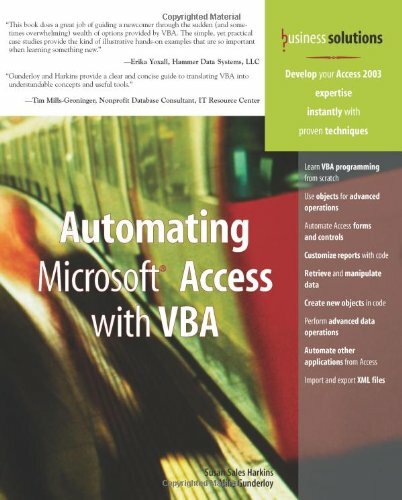 If you use Microsoft Access in your every day business life but haven't learned to fully exploit the program, now's your chance.Automating Microsoft Access with VBAis a thorough introduction to programming Microsoft Accessing using Visual Basic for Applications (VBA). With this book, you will gain a working knowledge of VBA and be able to customize your Microsoft Access databases. You will cover topics that include: Operators and functions Debugging and error handling Menu commands Forms and reports Jet databases DAO object model Save money by learning to use VBA to customize your databases instead of paying someone else to do it for you! What's ADO and Why Do You Need It?